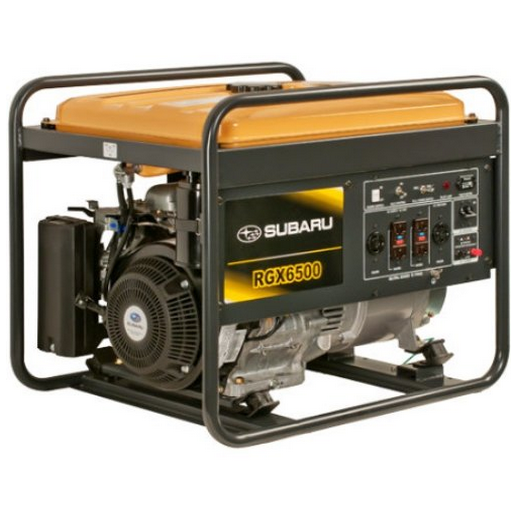 This Subaru RGX6500 gas powered generator has a recoil start and is OSHA compliant. It is best used for power outages and for outside events such as tailgating parties and camping. This product sells for about $2,100 on Amazon. It comes with a three year limited warranty and has a fuel capacity of 7.3 gallons of gas. You can get two wheel kits at purchase. The main feature is it has a noise level of 75dba and it can run at 5,000 rated watts and 6,500 maximum watts. The hour meter that helps you know when you need to maintain the generator. An additional feature is the low oil shut down that helps prevent engine damage. Other features include a fuel gauge to determine how much fuel is left in machine, the ability to run for eight hours on one half load, and an automatic idler control that lowers the engine speed and increases fuel efficiency while reducing its noise level. This product is recommended for its low noise level and easy to use features.